7 tablespoons sel gris, divided (its a course granular sea salt) you can substitute with Maldon Sea Salt. Step 1 Preheat oven to 550°F with oven rack in center of oven. Trim stem of cauliflower, keeping leaves intact, so it will sit level on a rimmed baking sheet. Bring 2 gallons water to a boil in a large stockpot over high. Stir in 61/2 tablespoons sel gris until dissolved. Step 2 Add cauliflower to water; place a heatproof ceramic plate on top of cauliflower to keep it submerged. Boil until tender and a fork inserted in cauliflower meets no resistance, 12 to 13 minutes. Using a spider, gently lift cauliflower from water, and let drain in spider, allowing water to drip back into pot. 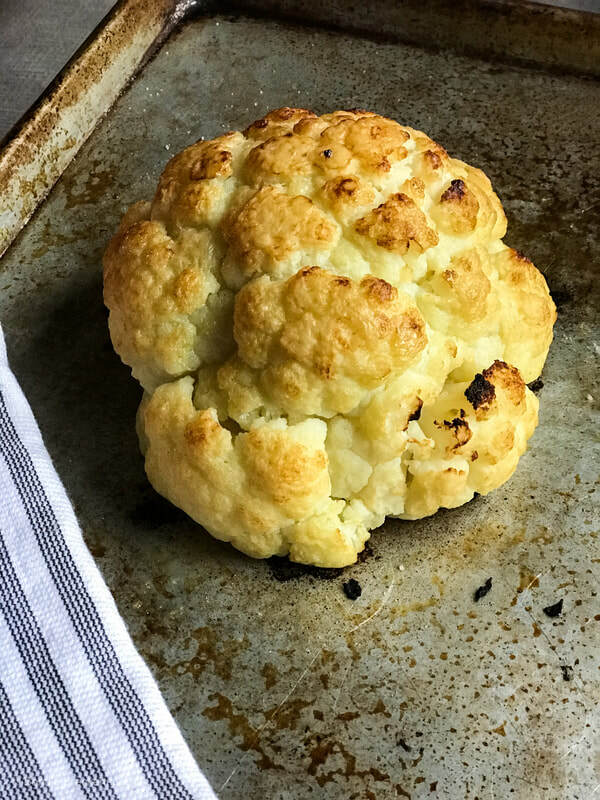 Place cauliflower, stem side down, on a rimmed baking sheet. Let stand until cauliflower has cooled slightly and is dry to the touch, about 15 minutes. Step 3 Rub 1 tablespoon olive oil between hands, then rub over cauliflower to apply a thin, even layer. (Alternatively, use a brush to spread oil evenly over cauliflower.) Sprinkle remaining 11/2 teaspoons sel gris over cauliflower (salt might clump in some places). Bake in preheated oven until dark brown, about 25 minutes. Remove from oven, and carefully rub with remaining 2 tablespoons olive oil. Serve hot.